The federal government invests years and millions of dollars proposing how it can revive declining Snake River salmon populations, doing everything - habitat restoration, hatcheries and barging - short of breaching four dams on the lower Snake. Salmon advocates file suit, contending the plan - technically called a biological opinion - falls woefully short of complying with the Endangered Species Act. The federal courts agree, tossing out the biological opinion. Such was the fate for the first plan, which was drawn up in 2000. The same thing occurred to its successor, prepared in 2004. Tuesday, U.S. District Judge James Redden declared the newest biological opinion, prepared in 2008 and since modified by the Obama administration, inadequate. "There is ample evidence in the record that indicates the operation of the Federal Columbia River Power System causes substantial harm to listed salmonids," Redden wrote. 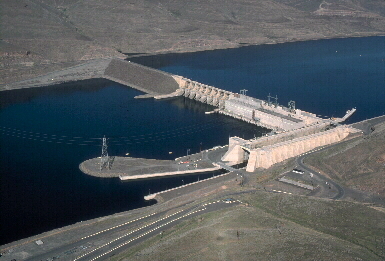 "NOAA Fisheries acknowledges that the existence and operation of the dams accounts for most of the mortality of juveniles migrating through the (Columbia River power system). As in the past, I find that irreparable harm will result to listed species as a result of the operation of (the power system)." Then he ordered NOAA Fisheries to draw up a new fish recovery plan that "considers whether more aggressive action, such as dam removal and/or additional flow augmentation and reservoir modification are necessary ..."
Translation: Years of study followed by more litigation. In spite of favorable ocean conditions, phenomenal spring runoff conditions and hatchery production that has generated fishing seasons, wild salmon recovery remains elusive. Last year's spring- summer chinook run produced 26,267 wild fish in the upper Snake, about a third of what may be required to satisfy the ESA. But no judge can deliver what fish advocates want - removal of the lower Snake dams. That lies exclusively within the purview of Congress. Don't count on it happening on Washington Rep. Doc Hastings' watch as chairman of the House Natural Resources Committee. "Despite broad, collaborative agreement on a recovery plan and years of record, or near record, fish returns, the Pacific Northwest is entrapped in a never-ending circle of litigation and judicial whim," Hastings said. So you're left with economic uncertainty hanging over Idaho's fishing industry, its port communities, electrical generating capacity and irrigators. Two years ago, U.S. Sen. Mike Crapo, R-Idaho, offered the outlines of a solution. At the time, Crapo was fresh on the heels of creating a wilderness package for southern Idaho's Owyhee Canyonlands. Crapo brought together groups that had been warring about the future of those lands in a collaborative setting - a model he has since applied to the Clearwater basin. Why not, Crapo suggested, employ collaboration to address the region's thorniest natural resource issue? Earlier in the decade, Crapo sought to bring irrigators and fish advocates to the table to resolve a legal battle that threatened to divert some of eastern Idaho's irrigation water toward fish recovery. Now, he suggested, collaboration would allow people throughout the region to take hold of their common destiny and arrive at a compromise everybody might hate but still be willing to live with. "In collaboration, all options have to be on the table, all interest groups must be represented fairly and everyone must come to the table with a willingness to participate. Does that mean dam breaching has to be on the table? - Yes," Crapo said. "But understand that also means not dam breaching must be on the table. All options must be openly and fairly discussed." Crapo got a lot of attention. But with litigation still pending, he got no takers. Now that another fish recovery plan occupying space in the trash bin, Crapo's offer merits another look. Or would you prefer five or 10 more years of stalemate? Tired of Losing? How About Something New?